This luxury commercial hunting resort and ranch for sale in Bandera and Medina Counties in Texas is absolutely a once-in-a-lifetime opportunity awaiting the discerning investor. Luxury lodging already in place comfortably sleeps 80 guests or more, hunting includes abundant native and exotic wildlife, and recreation includes a swimming lagoon, a boat dock and great fishing on Medina Lake and miles of trails. 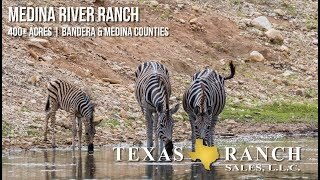 The 400 acre Medina River Ranch Resort is under 10 miles outside of historic Bandera, Texas, the Cowboy Capital of the World, and just over an hour from San Antonio. A dramatic gated entry from paved Old Castroville Road leads to a one mile long paved ranch road that leads to a bridge across Rocky Creek and then on to the Main Lodge and Conference Center overlooking Medina Lake. The Lodge and Conference Center is the ranchs state-of-the-art entertainment hub and includes a Business Center, a lounge area with a bar, and a lakeview patio for outdoor dining. This building is perfect for everything from corporate retreats to weddings. Near the Main Lodge is the Ranch Villa with 12 luxury hotel style rooms, five elegant cabins with a combined total of 15 bedrooms, and a bunkhouse that sleep up to 10 people. Other resort attractions include a swimming lagoon located in a park-like setting that includes Tiki huts and outdoor grills. Set in the ideal Texas hunting region between the Texas Hill Country and South Texas Brush Country, this ranch boasts Whitetail deer scoring from 120 to 350 as a result of a decade-long focus on improved genetics and a scientific food program. Other native species on the ranch include fox and bobcat, as well as dove and turkey. The ranch has also been stocked with numerous exotics that push the record books, including Elk, Fallow, Axis, Black Buck, Addax, Oryx, Scimitar Oryx, Red Stag, Aoudad, Mouflon, Sika, and Zebra. The ranch is divided into three high fenced pastures. Medina River Ranch can also facilitate the fishing trip of a lifetime as the adjacent Medina River Lake is well known for its great largemouth bass population and enormous catfish. Fly-fishing is also available on Medina Lake. The resort has its own ramp and boat dock on the lake. Medina River Ranch Resort & Conference Center is home to some of the finest hunting action in Texas right alongside upscale accommodations. The resort was developed in 2001 to provide guests with the highest quality adventures possible while participating in all types of associated events. Corporate meetings and hunts, family vacations, weddings, and couple getaways are just a few of the services this ranch has offered. The creative investor will find numerous profit centers within the 400 acres of this lake-adjacent hunting ranch.